European Maid Co Blog: American Lung Association: Dust mites at home can dramatically impact the health of people. American Lung Association: Dust mites at home can dramatically impact the health of people. 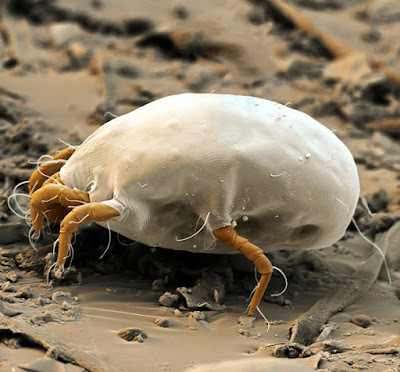 Dust mites. We've heard of them. We can't see them. But they could be all around you... including inside your lungs. The American Lung Association states "Mites are one of the major indoor triggers for people with allergies and asthma. Dust mite exposure can even cause asthma." Basically, if you're home has dust mites all the time and you have allergies, you will be miserable. Symptoms range from runny nose and watery eyes to more difficult issues such as persistent sneezing, coughing, facial pressure, and full on asthma attacks. Unfortunately, there isn't much you can do to prevent dust mites from being in your house. One of the few things can do is to try and keep your home dry. You reduce humidity in the house by using air conditioning and a dehumidifier, but that can only do so much. The best thing to do is to clean certain problem areas where dust mite carcasses and feces can build up. This includes persistent damp mopping, vacuuming carpets, and bedding washing. The American Lung Association recommends doing these these at least weekly, but more often if possible.